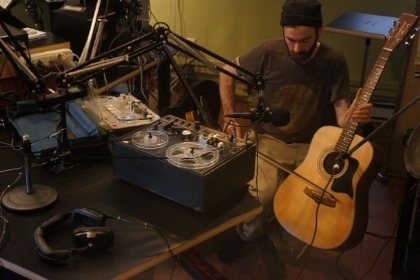 Nick Kuepfer live on the Free Music Archive! Remember how our lovely pals over at Constellation Records stopped in a few times over the month of March to host the Montréal Sessions on CKUT? For their final broadcast, the brought local sound-smith Nick Kuepfer along to finish off their residency in the utmost style! The performance was something truly special, and now we’ve got it preserved in the digital amber of the Free Music Archive for all eternity – or at least until the oncoming digital dark age. This entry was posted in CKUT programming and tagged Constellation Records, Free Music Archive, Nick Kuepfer, The Montreal Sessions on March 28, 2013 by Dorian.